W.A’s strong and vibrant music scene is supported by the many amazing record stores spread out across Perth and Fremantle, as well as the rest of the state. We’ve gone and created a short list of some of the best record stores in Perth that you should check out, if you haven’t already. Gracing both Leederville and Vic Park, Rhubarb Records has become a hub of local talent pressings. From their 12” Rhubarb Jam capturing the hottest hits from the region, to small gigs in house, Rhubarb have been delivering since their inception in 2013. 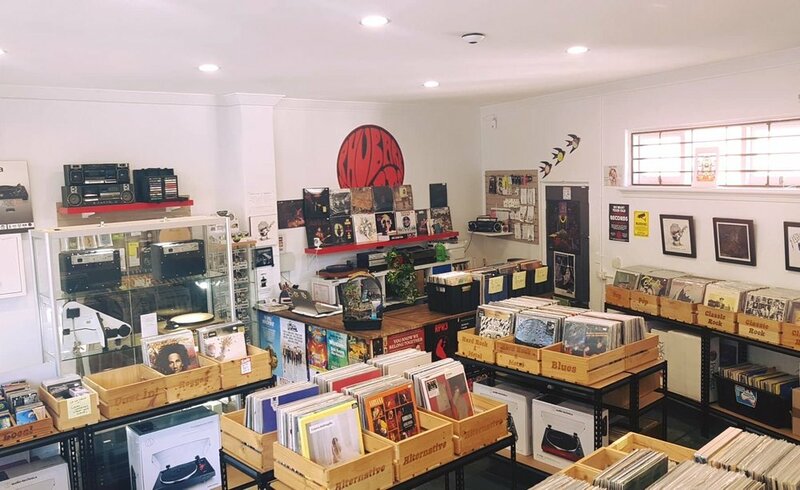 Located on busy Adelaide Street across from Kings Square in Freo, Mills Records is run by people passionate about music and delivering quick results based on what tunes you desire. Mills have a strong collection of local artists, showing off the local talent of Fremantle and Perth. Founded in 1966, The Record Finder have a massive collection of thousands of records in their two-story building, located on High Street in Fremantle. Family-run, and full of deep musical knowledge, make sure you give yourself some time to explore this vintage store. The Junction is a short walk off the main streets of Freo, off one of the many side alleys of Fremantle. The staff know and love their music, specialising in 60's psych, blues, folk, metal, alt country and everything in between, check their collection out. A feature of William Street in Northbridge, Noise Pollution specialises in second-hand collections. Their weekly “Good Morning Fine People” Facebook updates capture what the store is all about; bringing the people of Perth the best of new rock, soul, jazz, and alternative pressings. Situated right in the centre of Perth, Dada Records specialises in delivering to the eccentric and all those in-between. Owner of nearly 40 years Rob Samson is constantly delivering new pressings, as well as old rare items, coveted by any lover of music. Hidden behind Beans & Bunches florist in Northbridge, this small store is decorated to feel like you have entered into your own adventure into the Savanna. Containing a strong collection of funk and soul, Safari’s have also followed in the footsteps of many local Perth record stores and don’t charge commission on local artists. After a bit of movement, Highgate Continental have now settled into their new home on William Street in Northbridge. Owners Basile and Alex Malkovic have stocked a large range of records and genres that you won’t find in many other stores out there, such as international tunes, which can be sampled on the stores listening stations. Crossing into both the literary and music worlds, Diabolik are a hub of knowledge. Formed from the crew of former Planet Video, the store stocks many different alternative and specific genres. The store tops off with with board games and some pop culture items. There is something for everyone at Diabolik. After nearly 48 years, 78 Records closed its doors for the last time March 3rd 2019. Part of Perth music culture and history, 78 Records was seen as the place to find the pressings you couldn’t find anywhere else. Visits from artists such as Joe Cocker, Van Morrison, Elvis Costello, Bette Midler, Lou Reed and Elton John capture the significance that 78 had not just within Perth, but all over the world. Vale 78 Records, we miss you.